Save now on all of our superior quality Eggbutt Horse Bits. 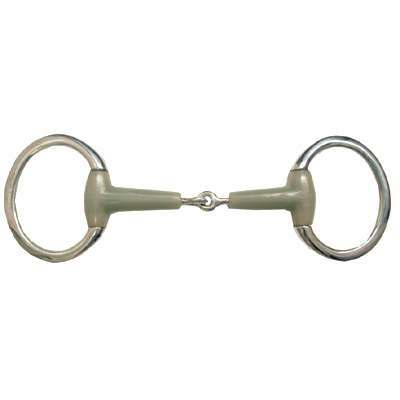 For the best prices on bits, buy online from Horse Tack Now. The Flexi Flat Ring Eggbutt Bit is easy on the mouth and almost stationary as it does not rotate around the rings wile preventing pinching of lips. This jointed bit applies snapping actions with rings and mouth piece applying pressure to different parts of the horses mouth. Every new Horse Bit offered by Horse Tack Now is professionally made and goes through a stringent quality control team that makes sure you only receive the greatest quality product possible. This item is also made of a rubber like material to make it easy on the mouth. This Flexi Eggbutt Bit measures 19mm in the 5'' and 16mm in the 5 1/2'' mouth.